A guillotine in Toronto, a piano that paints in Qatar, a musical pine tree for the city of Montreal, a giant periscope as part of C2 Montreal activities… this is just a small sample of the crazy projects brought to life by Dix au Carré. Launched in 2012 by Félix Marzell and David Barabé, Dix au Carré is a research and development laboratory specializing in creative design projects. 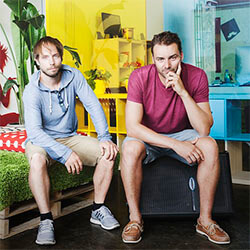 In its 4,500 square foot Montreal studio, Félix and David have undertaken projects that mix creative artistry and performance technology at the request of artists, members of the entertainment industry, and companies from around the world. Dix au Carré takes a creative problem posed by its clients and moves it from concept to completion working with a variety of materials, including wood, plastic, metal and composite. Dix au Carré was born from a meeting—a connection between two young creative minds with a passion for artistic performance and the mechanics involved in creating them. That passion brought them together, and the partnership was solidified by their complementary skill sets: design and user experience for Félix and engineering and modeling for David. Their first collaboration was creating giant marionettes for the Just for Laughs Festival, for which Félix solicited David’s expertise. The project revealed something for Félix: “I believed that it would take four days to do and it took four hours! It was just amazing how our brains connected! After that first meeting, I said to David, ‘We should always work together, it’s magical what just happened!’” The next day, David proposed the idea of launching a proper business and, one week later, he resigned and signed a five year lease for the studio together with Félix. It is through the CDEC and the grant “Jeunes promoteurs” that the two co-founders heard of Futurpreneur Canada and were able to receive the funding to start their business. Since then, Dix au Carré received many awards, including the Prix Montreal Inc. in 2013. Also, the mentor that Futurpreneur Canada connected them with played a part in the evolution of their start-up and "we felt unique by highlighting our successes, "says Felix. Today, what surprises the co-founders is the quality of projects they are capable of accomplishing and in such little time. With each new project, they feel a unique excitement and they thrive on the sense of accomplishment. Félix believes that this feeling is common to all entrepreneurs who sacrifice enormously and work an incredible number of hours to achieve their dreams.